If you're an owner of any of Samsung's 2016 SUHD quantum dot TVs then from today you'll be able to download a firmware update to enable the company's HDR+ upscaling technology on your model. The technology performs a similar function to a 4K upscaler which turns HD content into 4K. In the case of HDR+, the technology takes video displayed with a standard dynamic range (or SDR) and broadens its range of brightness to make it high dynamic range (HDR). The resulting image won't look as good as native HDR content, but it should be a useful stopgap until HDR content becomes more widespread in the same way as HD upscaling. Jamie Carter was impressed with the HDR+ upscaling when he saw it in action on the Samsung UE55KS7000, but we'll have to wait and see whether the feature works as well across Samsung's entire range. 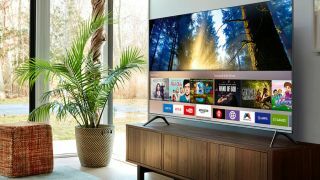 The firmware update to enable the feature on Samsung's SUHD televisions is available now, and non-SUHD HDR televisions will be receiving the same update in September.